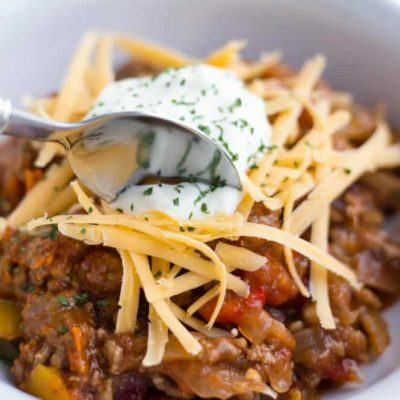 Slow Cooker No Bean Chili that is whipped together in 10 minutes and the slow cooker does the rest of the work! This is THE recipe you need for a weeknight dinner meal now that school has started again. Hey everyone! 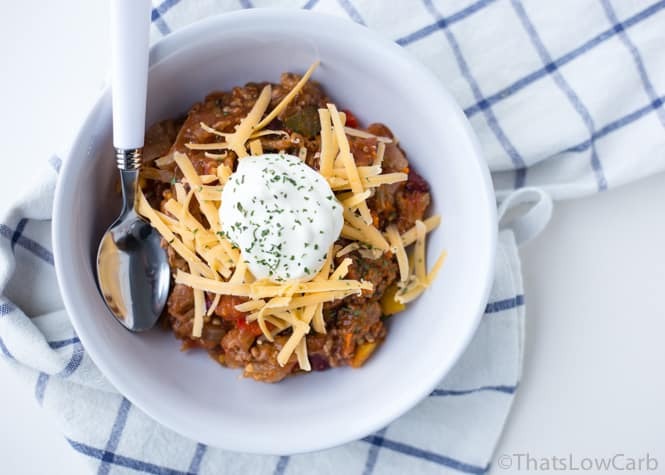 This is Lindsay again from over at That’s Low Carb and today we are bringing you our epic and delicious slow cooker chili recipe the entire family will love! My priorities for dinners are they have to be easy, quick and really really need the leftovers to be re-heatable. Slow Cooker dinners almost always fit that bill. 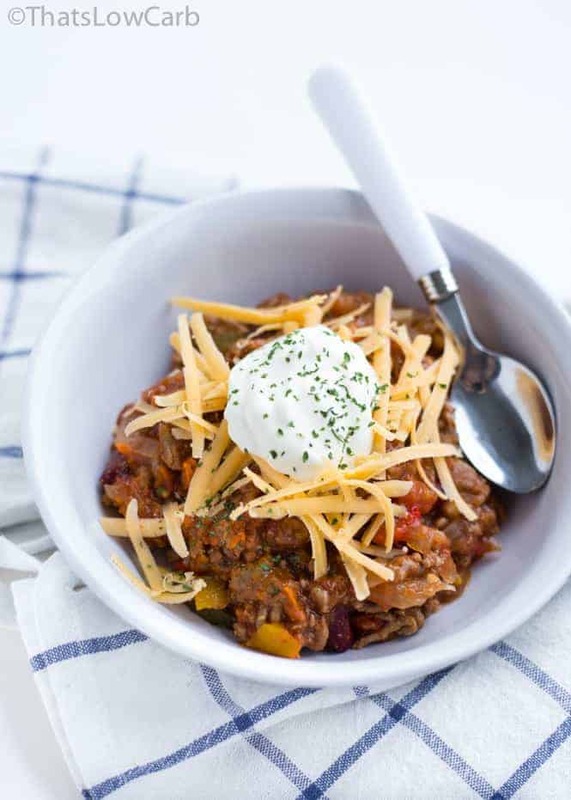 This Slow Cooker No Bean Chili, in particular, is all that you need and it checks all of those boxes. Our other family favorite recently has been this Low Carb Chicken Meal with Spinach, Goat Cheese and Artichokes! We’ve been making these on a weekly rotation! We like our easy dinners. The only real prep work for this slow cooker chili is to cook the beef on a skillet first before placing into the slow cooker. After that, you chop some veggies up and throw that in the slow cooker. Place the lid on top, set it and forget it. Now if you aren’t following a strict Keto or Low Carb Diet feel free to add a can of kidney beans to this no bean chili for extra protein and fiber. My family is low carb and at times we’ll add a can of kidney beans but more often than not we’ll make it sans the beans like the recipe below. Enjoy! 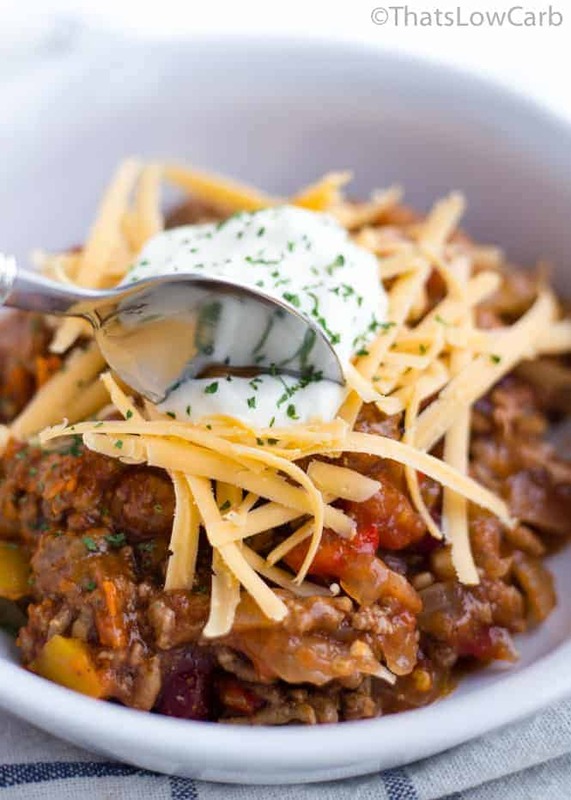 Slow Cooker Bean Free Chili that is whipped together in 10 minutes and the slow cooker does the rest of the work! This is THE recipe you need for a weeknight dinner meal now that school has started again. Brown the meat in a skillet. Add everything to the slow cooker and stir together. Cook on Low for 6-7 hours or High 3-4 hours. Chicken broth would also work. 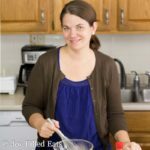 This recipe states the nutrition facts, but doesn't state what the portion size is for the breakdown.. Does anybody know? It's at the top of the recipe card. This has 6 servings. Do you think this could be done in an instant pot? Yup! I'd just look up timing and settings for an instant pot chili and copy it. Thanks so much for this receipe! My husband loved it!! Hi, this looks really delicious and would love to try it but I don’t have a slow cooker how is it possible to make it with out? Yup! You can just simmer on low for a couple hours instead. This chili would definitely solve the bean or no bean debate. 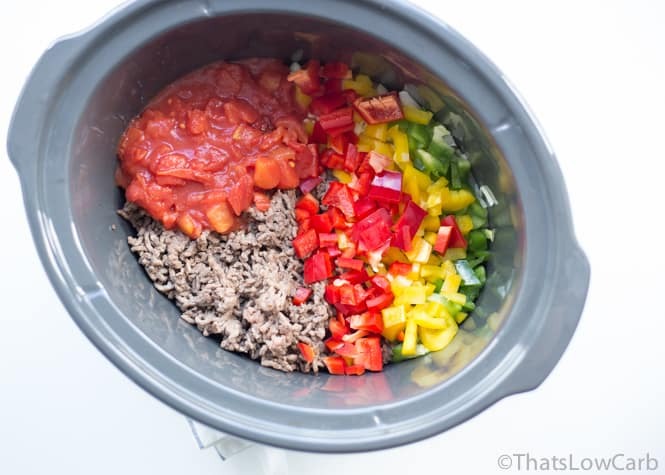 Either way, it looks delicious and super easy using the crockpot! I'm a coffee first girl but agree that I need leftovers built into my weekly dinner plans! 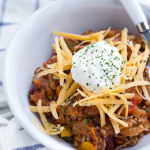 I am a sucker for chili when it cools down, and I've been trying to cut a lot of carbs out of my diet. This looks like a perfect solution - what do you think I could add to get that bean texture, though? Black soybeans? If you aren't keto you could just add some black beans. They really don't have that many net carbs because they have so much fiber. 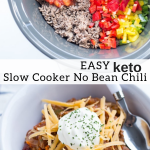 I have made a keto chili recipe that used diced pork for the bean texture. I plan on adding that to this recipe. That's a great idea! Thanks for sharing. can you prep this the night before like add the meat with everything but the veggies? Yes, this should work to prep ahead of time. Sorry for the delay! That was an error in the comment. You should brown the meat first. But it would work either way. Do you brown the beef first? Or just let the slow cooker do its thing? You can either just let the slow cooker do its thing or brown the meat first. If you choose not to brown the meat the chili might have more liquid. If you prefer a drier chili brown and drain the meat first. How big is the serving size? 1.5cups.? Yes, about that. It will vary a little depending on the size of the vegetables, etc.